A work colleague lent me this book that was sometime 2 years ago. I really liked it. It is called Lemonas Tale but it could be the tale of any young female Nigerian citizen in Nigeria. This novel tells the story of the struggles of a young woman in search of a better life, how she ended up in prison. It is a very easy read. I am so grateful this book came across my way. 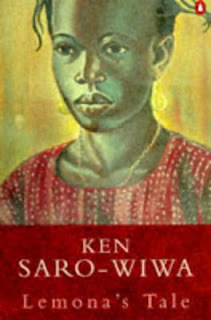 That was how I actually discovered about Ken Saro Wiwa (his first book I read), how he was detained, jailed, trialled and unfairly executed by hanging by the Nigerian Abacha military regime back then in 1995. I recommend this book to everyone. Hopefully I will get to read more works from Ken Saro Wiwa.